Braised chicken with scallion purée . . . This recipe is adapted from one appearing in The Cook and the Gardener by Amanda Hesser (W. W. Norton & Company, 1999). 1. Heat oil in a large skillet over medium-high heat. Season chicken with salt and pepper, and cook, skin side down, until golden, about 5 minutes. Turn chicken, add two-thirds of the scallions, and brown chicken on other side, about 3 minutes. Transfer chicken to a platter. 2. Continue to cook scallions until just soft, 1–2 minutes more. Add wine, scraping up browned bits with a wooden spoon, and reduce by half. Return chicken to skillet, and add stock and potatoes. Reduce heat to medium-low, and braise, partially covered, until chicken is cooked through, about 50 minutes. 3. Transfer chicken to a platter, and loosely cover with foil. Strain braising liquid into a small bowl. Transfer potatoes and scallions to a medium bowl. Return braising liquid to skillet, and reduce by half over high heat. Add remaining scallions, and cook for 30 seconds. Mash reserved potatoes and scallions with a fork; then stir in heavy cream. Season to taste with salt and pepper. 4. 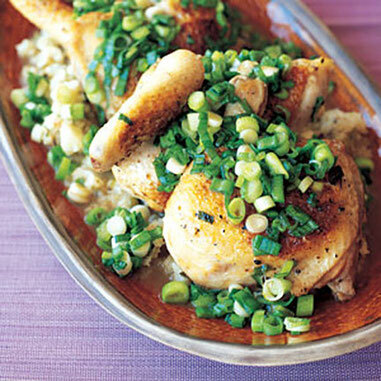 Put potatoes on a serving platter, arrange chicken over potatoes, and spoon scallions over chicken.